When someone offers you a chance to drive a brand new Maserati over a weekend, you’d be a fool to say no. From the moment you slide into the supple Italian leather driver’s seat and press the starter button on the left side of the steering wheel, you know you’re in something special. The twin-turbocharged 3-liter V6 whirrs to life with a guttural roar and quickly settles into a frenzied idle. It’s immediately clear that this engine can trace its heritage back to the Ferrari factory where the heart of this car is built alongside the fiercest engines in Maranello. Speaking of which, the 3-liter V6 comes with a pair of turbochargers which boost power to 404 bhp and 405 lb-ft of peak torque available all the way from 1750 RPM to 5000 RPM. Although this is a 4,200 lb vehicle, it’s actually 150 lbs lighter than the outgoing model while offering similar power. 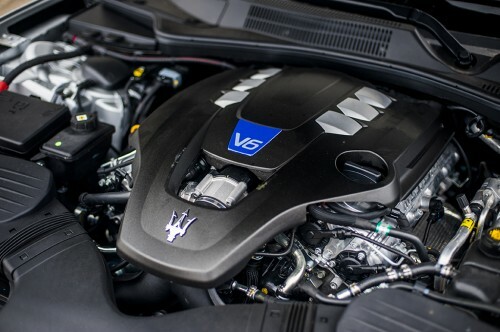 What that means is that with all this power and style, the 2014 Quattroporte is significantly more fuel efficient than the previous generation, offering 15 city and 24 highway MPG. With the 8-speed ZF transmission, this car is definitely a great highway crusier. The huge range of gears allows for effortless high-speed cruising while sipping fuel. Of course, with the available paddle shifters, you’re never more than a few clicks away from flying at warp speed. On top of all that, the Quattroporte S Q4 features a clever all-wheel drive system that seamlessly transfers torque between the front and rear wheels, ranging from a 50/50 split between the front and rear wheels all the way to 100% of the power being sent to the rear of the car. All of this torque shuffling can be watched in real-time on the full-color instrument cluster display. With winter weather quickly approaching, there’s no doubt that this all-wheel drive system will help power the Quattroporte through all sorts of adverse conditions. In warmer, drier conditions, the Quattroporte S Q4 uses its all-wheel drive and wide, sticky summer tires to blast to 60 MPH in just 4.9 seconds. While opinions vary on the new Quattroporte’s styling, in my eyes, it’s a much more refined and cohesive design compared to the outgoing model. 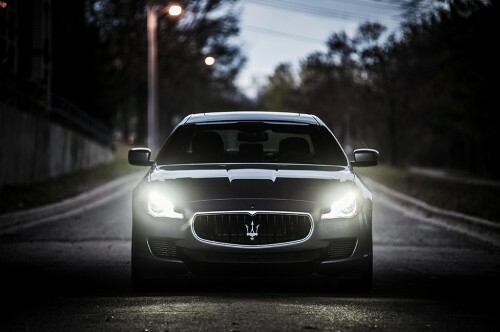 The signature Maserati grille presents a menacing, snarling face which is framed by LED-lined headlights that give the Quattroporte an angry, aggressive look. It’s certainly more fearsome looking from the front than it is on the swoopy sides and contemporary rear end with quad tailpipes accentuating the wide hips. All in all, it’s an elegant design that exudes class and sets itself apart from the sea of BMW’s, Mercedes, and Audi’s out there. My only gripe is that the long, 125-inch wheelbase and curvaceous fenders are begging for some bigger wheels. Although I love the design of the standard 19-inch wheels, something in the 21 or 22-inch range would suit the car better, in my humble opinion. Luckily, there is an optional 21-inch wheel package available from Maserati that looks fantastic as well. Turning our attention back to the inside of the Quattroporte, nearly everything you touch is beautifully trimmed in either buttery soft Poltrona Frau leather – which is the same supplier for Ferrari and Bugatti, among others – or suede-like alcantara for the headliner, sun visors, and pillars. Along with the Q4 all-wheel drive system there are four heated seats as well as a heated steering wheel, something I definitely appreciated during the chilly weekend I spent with the Quattroporte. Further down on the dash, we see shiny Erable wood trim – which is also integrated as a ring around the outside of the steering wheel – and a real aluminum bezel around the 8.4-inch touchscreen navigation screen. For those wanting a sportier look, real carbon fiber trim is available as well as three other types of wood including a really unique unfinished, open-pore Radica wood trim. It all adds up to a really nice place for passengers to sit back and relax, or hang on for dear life should you choose to set the engine mapping and suspension into Sport mode and let it rip! Looking at the Maserati’s family tree, there is now a branch connecting parent company Fiat to Chrysler. 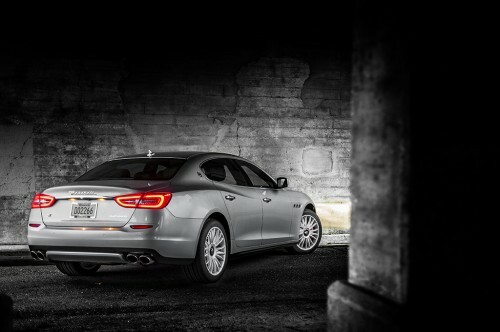 The Italian giant took control of Chrysler a couple of years ago as they struggled in bankruptcy. As a result of the acquisition, we now see some parts sharing between Maserati and Chrysler, however the Quattroporte is nothing like Chrysler’s TC by Maserati from the early 1990s that was basically just a tarted-up LeBaron. Instead, Maserati has borrowed Chrysler’s Uconnect infotainment platform, now called Maserati Touch Control and featuring navigation by Garmin. Now before you cry out against this parts sharing between the famed Maserati and lowly Chrysler, keep in mind that the Uconnect system is one of the most acclaimed infotainment systems on the market today. What this means is that not only is the infotainment system highly capable but it’s also incredibly user friendly. The 600-watt standard stereo sounded really nice but for those looking for a true world-class audio system, consider the 15-speaker, 1280-watt Bowers & Wilkins speaker package. For those who anticipate frequently driving rear seat passengers around, you may also want to consider the sleek rear seat entertainment system, with or without the folding tables built into the front seat backs. On top of that, there’s also an available WiFi hotspot which is a must for heavy tablet or laptop users. So what is it actually like to drive a Maserati Quattroporte? Well, despite its size, this thing is built to hustle. Although the sport mode for the exhaust and suspension help contribute to the dynamic feel, I typically found myself driving in the default mode, enjoying the supple suspension and quiet, luxurious cabin. Regardless of the settings, dipping your right foot into the throttle will exude a sonorous crescendo of sound as the punchy V6 winds out to its redline. Although the power delivery is smooth and seamless, this is one car that will definitely push you back into the seat. After posting a few quick cellphone pictures of the Quattroporte on Facebook I suddenly found myself with a lot of friends that inexplicably needed rides and everywhere I went – from the gas stations, to restaurants, and even a simple beer run to the Four Firkins – the 2014 Maserati Quattroporte granted me VIP treatment at every stop. Now try to imagine that happening in your run of the mill BMW 7-Series, Audi A8 or Mercedes S-Class. From the moment you arrive, the Maserati exudes class and exclusivity that is unrivaled in its price range. 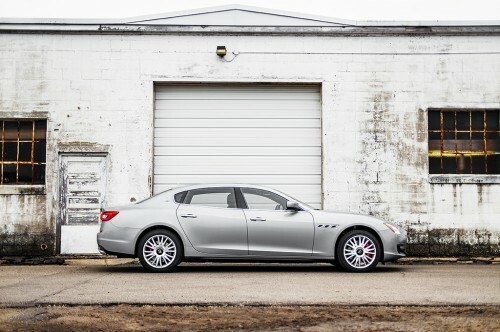 Speaking of which, the 2014 Quattroporte S features a base price of $102,500. Add in the all-wheel drive and heating package for $4,710 and $1,500 for delivery from Italy and you’ve got a beautifully crafted, exotic sedan for $109,010. Guest blog post written by: Alex Bellus – a well-known automotive photographer in the Twin Cities area and a frequent attendee of MN C&C at the Automotorplex. He is an Automotive Analyst for IHS Automotive and has a wide range of automotive knowledge. Keep your eye out for his next Blog Post where he will highlight another popular new vehicle! Print article This entry was posted by Alex Bellus on November 13, 2013 at 9:36 pm, and is filed under Maserati News. Follow any responses to this post through RSS 2.0. You can leave a response or trackback from your own site. Pretty section of content. I just stumbled upon your web site and in accession capital to assert that I get in fact enjoyed account your blog posts. Anyway I will be subscribing to your augment and even I achievement you access consistently fast. Usually I don’t read article on blogs, however I would like to say that this write-up very pressured me to take a look at and do so! Your writing style has been surprised me. Thanks, quite great article. Some genuinely nice and utilitarian information on this site, likewise I conceive the design holds great features. Excellent site. Plenty of useful info here. I’m sending it to several pals ans also sharing in delicious. And naturally, thanks for your sweat! Hello my family member! I want to say that this post is amazing, great written and include approximately all significant infos. I would like to peer more posts like this. My wife and i got really excited that Raymond could finish off his research via the precious recommendations he grabbed through your web pages. It is now and again perplexing to just continually be giving for free hints which often some people might have been selling. And we all take into account we’ve got the blog owner to be grateful to for this. The most important explanations you have made, the simple site menu, the friendships you can help instill – it is all astounding, and it’s really letting our son in addition to our family do think this subject is satisfying, and that is truly essential. Thanks for all!